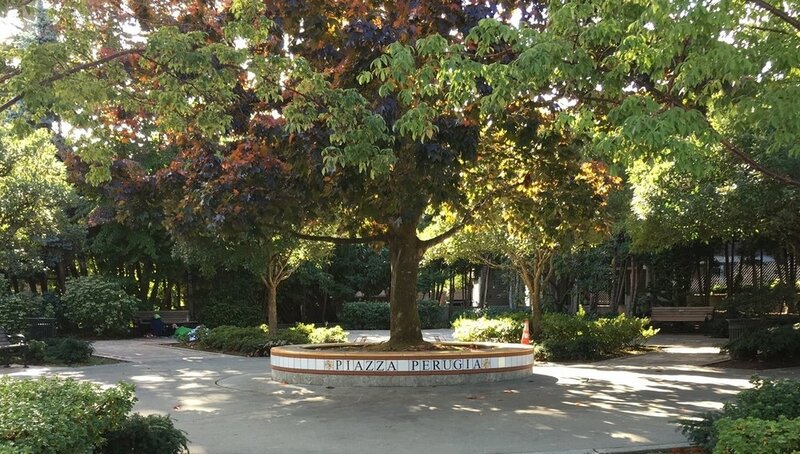 Seattle and Perugia have shared a special relationship for quite some time, and this was cemented with the founding of the Seattle-Perugia Sister City Association back in 1991. The SPSCA puts on a variety of educational events every year including book talks, wine tastings, film dinners, and more. Individual membership is only $25 a year, and there are many benefits such as information about local Italian events, the opportunity to win a scholarship to study in Perugia, and, most important, the chance to help promote cultural exchange between these two communities. You could be the next candidate for the Perugia scholarship, so if you're interested in joining, please sign up on the SPSCA website here. We're excited to announce that Seattle has a new park, dedicated to Perugia, as a symbol of Seattle and Perugia sister-city friendship. Thank you to everyone who came out and joined us at the dedication event. This is a great way to celebrate the longstanding sister-city friendship of these two cities. An Umbrian ceramic arts studio, L'Antica Deruta, designed and created decorative tiles that were installed in the piazza by Nadine Edelstein, a tile artist from Vashon Island. The director of L'Antica Deruta, Giorgio Moretti, attended the ribbon-cutting ceremony as well as both Seattle and Perugia's mayors. The center is called Il Punto! (“the point”) because it is intended to be il punto d'incontro (“the meeting point”) for all Italians, Italian-Americans, and people passionate about Italy from around our region. The mission of Il Punto! is to promote Italian culture through our common passion for food, literature, art, design, film, theater, dance, language, and music. Il Punto! offers small Italian conversation groups twice a month for different levels. This is a great opportunity for students to practice conversation in a casual setting at next to no cost. Please visit Il Punto!’s website for more information about upcoming sessions, or contact Il Punto! here if you would like to be involved in any way. We strongly encourage our students to join Il Punto! and SPSCA, both as members and as volunteers. Being involved in the greater Italian community is a good way to learn the Italian language and culture, and help out a good cause. SIFF is renowned for its annual international film festival, attracting moviemakers and film lovers to the big screen every spring for a great selection of films. We like to spotlight the Italian films at the festival by promoting them with students and friends of percorsoItaliano. In addition to its international festival held every May/June, SIFF features Italian movies at Cinema Italian Style every November. percorsoItaliano has been a sponsor of this festival for several years now, and we believe they do excellent work promoting the Italian culture through a wide range of films. Whether you are taking our film class at percorsoItaliano or you are just interested in cinema, watching Italian films is a great way to learn more about the culture and hear the language in a natural setting. SIFF is one of the country's most recognized film festivals and does an incredible job of choosing movies that represent different countries around the world. We encourage you to attend other movies as well, as we are very proud of how SIFF carefully selects films that will enhance your understanding of the world. Please visit SIFF’s website to learn more about its great work. Mark your calendars for SIFF Cinema Italian Style: November 9-16, 2017. We're excited to promote the 16 Italian films that will be part of the 9th ANNUAL ITALIAN FILM FESTIVAL, hoping you'll have the chance to catch a screening or two. At the festival, you will have the opportunity to enter the Seattle-Perugia Sister City Association's raffle for a free trip for two to Italy. Many percorsoItaliano students have already purchased tickets in class, but for those who haven't, make sure to stop by the desk and say hello to Roberta, Elisabetta, or other members of SPSCA. (Tickets are only $5 each.) The second prize is a 10-week class with percorsoItaliano and the third prize is a $160 Crown Limousine gift certificate for any type of transportation. The winners will be drawn on the closing night of the festival, November 16. Winners do not need to be present. For more information, please visit SIFF Cinema Italian Style. We also collaborate with the Northwest Language Academy (NWLA), leading Total Immersion Weekends on Whidbey Island every year. Our Total Immersion Weekends are a fun and affordable way to spend a weekend speaking Italian, cooking an Italian meal together, watching Italian videos, and engaging in language activities on beautiful Whidbey Island—all without getting on a plane to Italy! Please visit NWLA’s website here and subscribe to our newsletter below to get the announcements about upcoming weekends.